For thousands of years the Chinese have been concocting herbal tonics for every ailment and bodily function. During the winter months when my skin is feeling dry and lacklustre, one tonic that I love to make at home is a healthy, vegan collagen–rich formula. 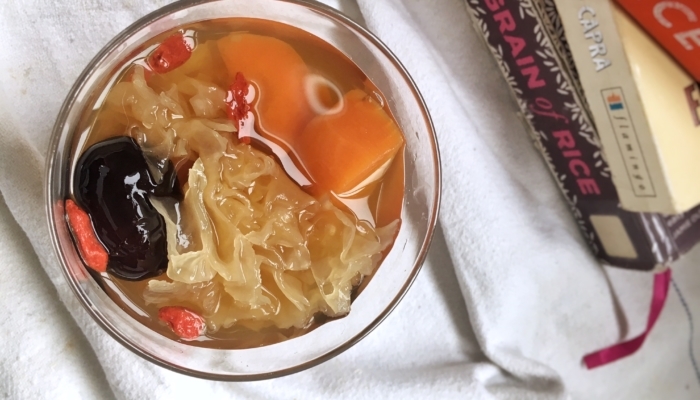 The secret ingredient is a beauty superfood little known in the West: snow fungus, or the tremella mushroom. Off putting though its name is, this tree dweller has impressive credentials. It may look delicate but the snow fungus is full of plant collagen and can hold up to 500 times its own weight in water, which can aid our skin to stay hydrated and maintain a youthful appearance. 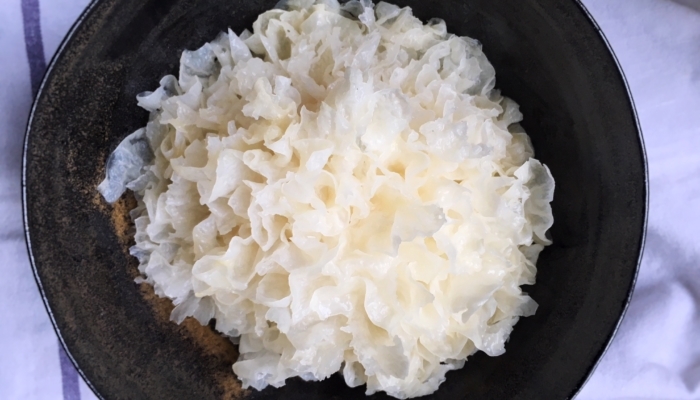 Traditionally it is recommended to cook snow fungus with Chinese almonds, since it is believed that they synergise each other. I suggest an easy substitute such as almond flakes. The tonic is also typically sweetened with interchangeable fruits, from papaya to goji berries. I like to work with ingredients I have to hand so in this recipe I have used Chinese jujube dates (which can be replaced by an apple or pear), and carrots, which are an excellent source of vitamin C, vital for the production of collagen. Delicately sweet with a crunchy texture, this tonic is delicious cold or hot. Be sure to eat all the fungus as that’s where all the collagen goodness is! 1) Cover the dried snow fungus with plenty of room temperature water in a bowl and let it rehydrate for at least 3–4 hours. Once rehydrated, it feels soft and spongy and will have tripled in size. 2) Using scissors, trim the hard base of the fungus but do not discard it. This base can be used as a face scrub! 3) Roughly cut up the fungus into smaller pieces and put all the ingredients into a large stock pot. 4) Cover with water, bring to the boil and simmer over low heat for at least one hour. 5) Serve in small bowls or glasses, with spoons for scooping out the contents. Ensure there is a bit of each ingredient in each serving. Sweeten more to taste, if desired. Want to know more Chinese beauty secrets? Click here to head over to Celestial Peach for more recipes for beauty from the inside-out. Want more Collagen? Click here to find out more about the Potion London Collagen Boost.